There’s nothing like a warm, sunny day of golf on Anna Maria Island. With a cool breeze from the gulf refreshing you, the incredible coastal scenery as your backdrop, and some incredible challenges to keep your game strong, the island is your epic golf getaway. There are several premier golf courses in Anna Maria and the surrounding area that offer impeccable amenities and field architectures. You may have to head just off the island to see the options unfold, but there are great golf courses at every turn. What makes a good golf course anyway? Even further, what makes a golf course PGA worthy? There’s a lot to appreciate when it comes to the sport, and Anna Maria delivers that greatness in spades. Between your golf outings, you’ll get to enjoy amazing historic sites, shopping centers, tours, activities on the ocean, and restaurants that are sure to impress. This is your introductory guide to having a great golf getaway on Anna Maria, including some of the best courses in the area, top destinations for lodging, and helpful things to look out for. It’s fascinating to explore the anatomy of a golf course, including its sand pits, the foliage, and even the grades of the playfield as the course advances to its end. The finest courses encompass various terrain, input water or sand hazards in precarious areas, and offer a mighty challenge. Yet, top-tier courses manage to ease back the difficulty and offer a riveting game that spans multiple types of obstacles, potential playstyles, and more. Manatee County Golf Course is arguably one of the grandest challenges in the region. The hazards are intense and merciless. It is the perfect counter to the family-friendly adventures of putt-putt golf. Pinebrook Ironwood is a nice complement to the challenging golf courses in Anna Maria. It is in a quiet and subdued residential area, with daily fees as low as $20. It also flexes these various obstacle types mentioned, offering a versatile range of hole architecture. Be sure to call ahead for tee times, costs, and information about access at any of the local courses and clubs. As you dive into your vacation plans, it’s a good idea to pinpoint a course or two that you absolutely have to play on. When staying on Anna Maria Island, you have at least 20 major golf courses available to you in the nearby area, including Bradenton, Sarasota, and Longboat Key. 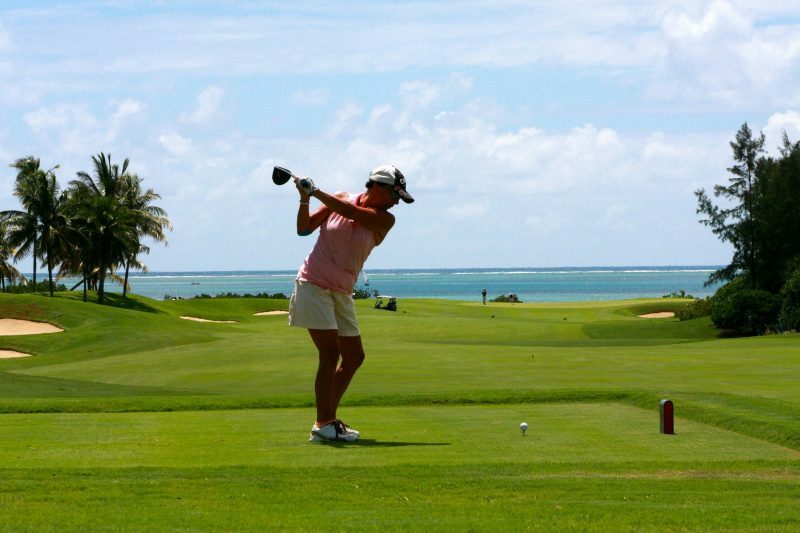 Where do you want to start your golf-themed vacation getaway? The answer may depend on your overall preference for private or public and the kind of experience you want. Public clubs are well known for their open arms, allowing visitors to walk right in and potentially play a game. It is the perfect encapsulation of the golfing culture of Anna Maria. Many of the best courses are open to the public, including Pinebrook Ironwood in Bradenton or Legacy Club in Lakewood Ranch, a modest drive inland. Do you want to stay on the island? A truly great golf course may have a lot to do with proximity to your place of residence, however temporary. Currently, Key Royale Club is the only golf course actually on the island, and it is private with a membership application required. Plenty of other great public courses are right off the island, however, such as Manatee County Golf Course, Timber Creek Golf Course, and Pinewood Ironwood Golf Club. You can plan a true golf getaway in Bradenton by also looking for some fantastic restaurants and activities around your golf course of choice. Most courses close at 6 p.m. or 7 p.m. Thankfully, you have several incredible Bradenton restaurants available right outside the local courses for a convenient golf and dinner outing. So, to sum it all up, it’s a good idea to choose a public course near AMI if you are visiting, consider the type of challenge you want, and call ahead regarding fees, tee times and details about the course. The possibilities unfold if you use your creativity. You can find innumerable attractions right outside some stunning vacation rentals. Just explore the area. Bradenton has great golfing at every turn.